OK, so I posted this in early July, and by the end of the month it was already potentially out of date. Peak Design, a company that makes some cool camera gear and bags has announced a Kickstarter for a carry-on travel bag that looks fantastic and might even be better than the bag I suggest below. Normally I wouldn't rush out and suggest people back Kickstarters, but these guys have delivered on several before and I think it is a good bet they will come through with this product too. I haven't tried it myself, but based on other products of theirs I own and what I can see online it looks really good. This is part 1, because in my mind there will be three parts to this - Carry on, checked bags, and packable day bags. That is the theory anyone. In practice I am just going to talk about some of the specific bags I am now travelling with, or that I was using during my time in Europe. It might not sound riveting, but someone actually did ask for it this time, so you have them to blame. See - Asked for it! I feel like most people understand these days that when possible it is best to only travel with carry on luggage. It lowers the chance of losing a bag, it speeds up check in and leaving the airport, and it means you don't have to deal with other people at the luggage carousel. Airlines will still happily take away your bag, even if it is within those dimensions. Not all airlines have the same allowed dimensions, and more so most appear to be actively lowering these or pushing back on people with big bags. Come on man, what are we even doing here? This might be tied to the size thing above, but people still seem to love bags with wheels. 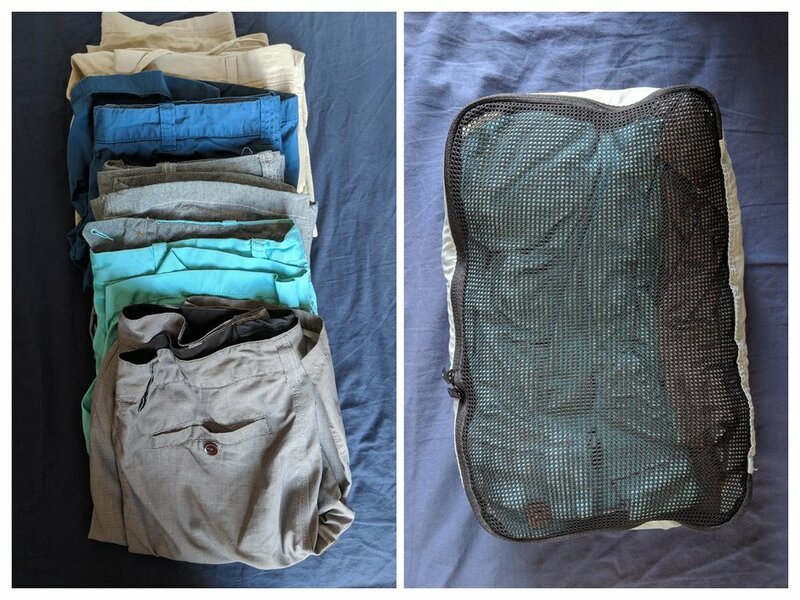 Bags like this also have problems, the obvious one is that the wheels take up space and actually means you have less room to pack things. The less obvious problem is that you will take it onto the plane, try and put it in the overhead locker in a way that isn’t wheels first (like they tell you to) and I will see this and think you are an idiot (clearly this is an important factor). Maybe most importantly if you bag has wheels it is much more likely to get checked at the gate than if it doesn't have wheels. I first saw the 1.0 version on Kickstarter and was happy to buy it then, it was designed by a couple of Kiwis (I think) and I ordered immediately. Unfortunately for me at the time it wasn’t shipping to NZ, so instead I got it delivered to a friend and picked it up in the US on my way to Europe. A couple of years later they released the 2.0 which I also readily brought and I haven’t been disappointed. It is generally slightly smaller than the size of the budget UK airlines carry on limits (so should be fine anywhere you go). Other than helping ensure you can bring it on the plane, this size is also key to forcing you to take less stuff with you (which you should always want). If you can’t fit what you need in this bag don’t complain about the bag, complain about what you are packing. The bag opens up fully, so you can pack it in a way you would a suitcase (as opposed to bags that only open at the top). 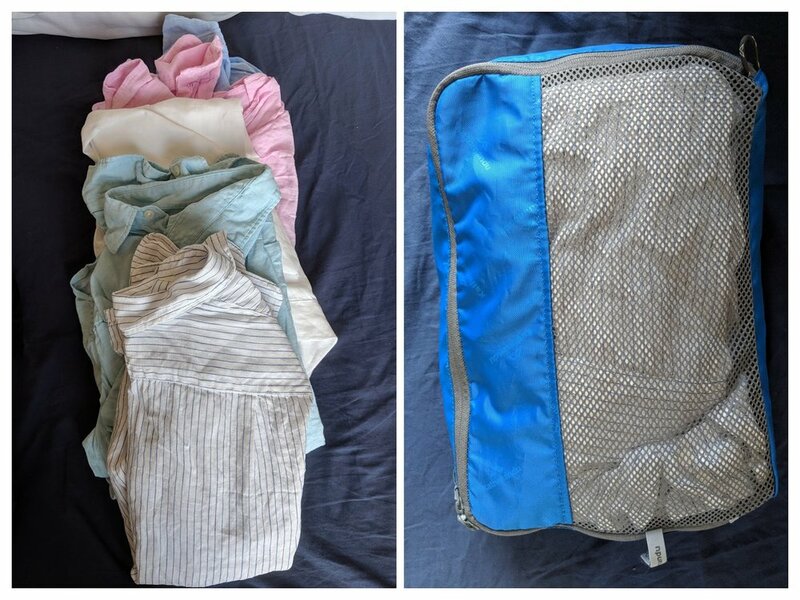 This is also good because once packed you can access any area of the main pocket without having to fully unzip it all (just move zips to the area you need, open slightly and pull things out). 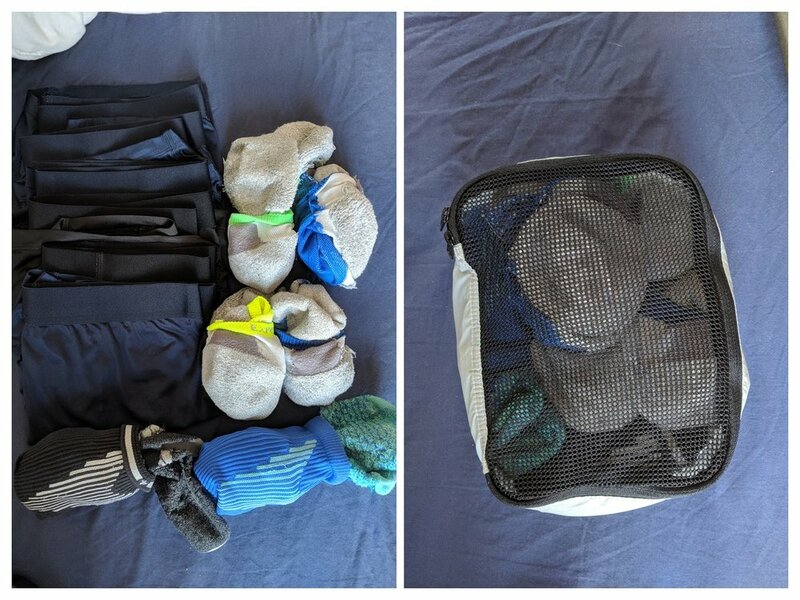 The main pocket is basically a single big compartment, so you can use packing cubes to make the most of the space (packing cubes are great… though not technically cubes?). There are a couple of flat inbuilt pockets in the main compartment that you can fit things you want separate in (like a pair of jandals?). The back pocket also has secure/padded compartments for a laptop or tablet, and several other for passports, pens, and any other flat type items you will be carrying. Again all easily accessible so you can pull stuff out at security without having to undo everything. There are also two pockets on the top of the bag that I've always used to keep my liquids when flying, but could obviously put anything there. I sort of touched on this above, but the point of a carry on bag is that you can carry it. This bag is lightweight, but sturdy, and the straps are comfortable even when you are carrying a lot in the bag - so you can easily wear it as a backpack all day (if for some reason you need to have a backpack on all day?). It doesn’t have an inbuilt hip belt (which help to take load off the shoulders), but it did have a hip strap that can be removed (it doesn’t do a lot, so I did remove it). You can also buy a padded hip belt for it, but I haven’t so can’t comment on that. Regardless the bag is comfortable and easy to carry around no matter what you've got in it. You can also store the back straps away and carry it like a briefcase or shoulder bag (with extra strap) if you prefer. Storing the straps also makes it easier if you did ever need to check it in. You might think that because I have owned two of these in four years that maybe they aren’t good quality, but you would be mistaken. The only reason I brought the second one is because I liked the first one so much and it made a few small improvements I wanted. 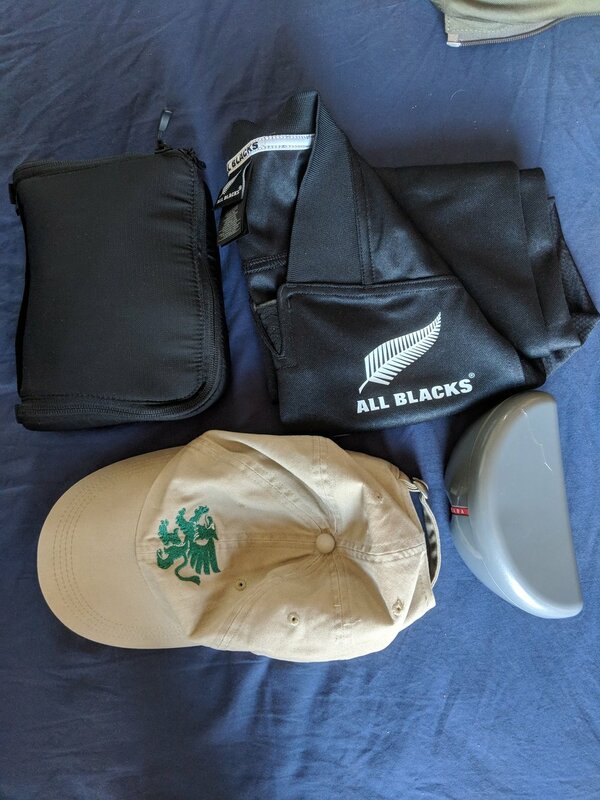 Both bags are still working perfectly and I am taking them both back to NZ with me to continue using them for many more years. So, that’s why I think it is a great carry on bag. I’ve used this for every trip I have taken in Europe for four years (except for Sweden Winter because I need heavy winter gear). This covered weekend getaways to two week long journeys. I could comfortably fit all I needed in there for those trips. And it was all in a bag I could still carry easily (the laptop and tablet didn’t help…), and that I have never had denied from carrying on a plan. Close bag. Put hat on top of bag (I guess). Remember to wear clothes to airport. 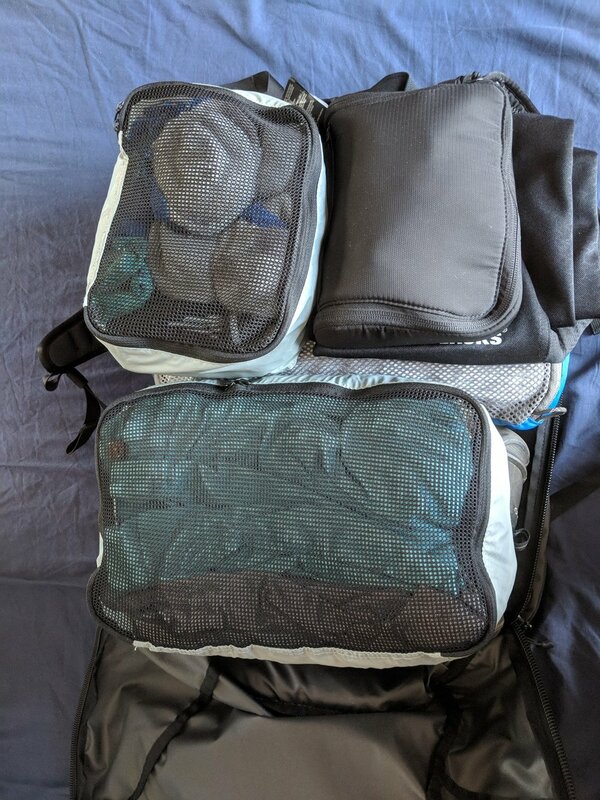 Any questions about the bag, or how to pack? Let me know!